“We did everything ourselves, from the sign out there to everything in here,” says Altin Begolli of the renovation that’s transformed the longtime space of the former Fid Resto into Efendy Turkish and Mediterranean Grill (1569 Dresden Row). After 10 years of working in restaurants in Halifax and dreaming of opening his own spot, and six months of seeking a location, he and business partner Ali Simsek—a Turkish chef who’s cooked in kitchens from Cafe Istanbul and Kebab Kitchen to Wolfville’s Troy— are just about ready to debut downtown’s newest eatery. With nothing frozen or fried, everything made from scratch and a strong focus on local, Efendy’s main attraction will be its charcoal grill which will cook up basically the entire menu, from skewers of lamb, chicken and fish (all local! ), to veggie options. And thanks to an open-style kitchen, you get a front row seat to all the action. 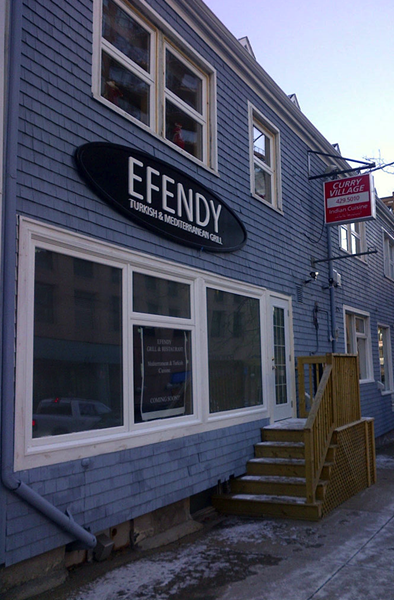 The pair plan to have Efendy open for lunch and dinner before Christmas.